Who celebrates the good times and helps you through the bad times in your life? Who listens when you just had a fight with your spouse? Who sees the 'real you' and likes you anyway? Things change in life. Jobs and addresses may come and go but, if we're lucky, our friends stay with us throughout our lives, making each day better. No one knows that better than author BJ Gallagher, who has done it again with her latest book, Friends: The family we choose for ourselves. You're such a good influence on me. You're like my coach, my cheerleader, my marching band all rolled into one person. I can never fail with you in my corner. I go for the goal 'cause you've got my back. I give it all I've got because you would expect nothing less. Having you as my friend makes me a winner. Friends is a book that you'll want to read...and more importantly, one you'll want to share with all of your friends in gratitude for their gifts of time, encouragement and support. As BJ says, "...the heart is where we hold our friends - like precious gems in a jewel box." Take time to celebrate the friendships in your life with this one-of-a-kind Friends. 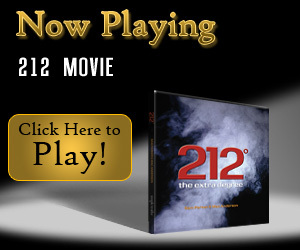 Enjoy the movie, 212 The Extra Degree, as a reminder that seemingly small things can make a tremendous difference. This book is a celebration of friendship and one you will want to share with all of your friends in gratitude for their gifts of time, encouragement and support. Make this week your team's week to go from good to great. Vitamin F Why do I have a variety of friends who are all so different in character? How can I get along with them all? I think that each one helps to bring out a "different" part of me. With one of them I am polite. I joke with another friend. I sit down and talk about serious matters with one. With another I laugh a lot. I may have a coke with one. I listen to one friend's problems. Then I listen to another one's advice for me. My friends are all like pieces of a jigsaw puzzle. When completed, they form a treasure box. A treasure of friends! They are my friends who understand me better than myself, who support me through good days and bad days. We all pray together and for each other. Real Age doctors tell us that friends are good for our health. Dr. Oz calls them Vitamin F (for Friends) and counts the benefits of friends as essential to our well being. Research shows that people in strong social circles have less risk of depression and terminal strokes. If you enjoy Vitamin F constantly you can be up to 30 years younger than your real age. The warmth of friendship stops stress and even in your most intense moments it decreases the chance of a cardiac arrest or stroke by 50%. I'm so happy that I have a stock of Vitamin F! In summary, we should value our friends and keep in touch with them. We should try to see the funny side of things and laugh together, and pray for each other in the tough moments. Thank you for being one of my Vitamins! This holiday season is the perfect time to start a ripple that can change the world. The magic formula for putting more joy into your life can be summed up in one word - kindness. So take a moment from your busy holiday "to-do" list to perform a random act of kindness. You'll bring joy to your own life, as well as the lives of others.